Hot, dry conditions this summer in England have revealed mysterious Stone Age ceremonial monuments, Iron Age settlements, burial mounds and a Roman farm. “A scorching heat wave that has left much of the English countryside dusty and brown has also uncovered parts of the country’s past that have been buried for millennia. Follow the link for more information, and/or see this Guardian article. 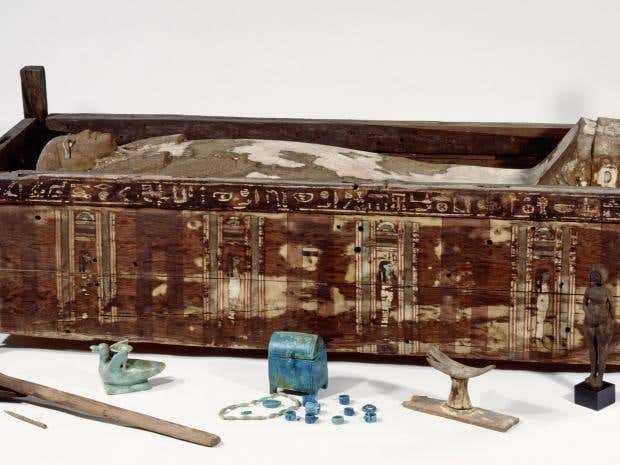 The researchers, writing in the journal Nature Communications, admitted their sample “may not be representative for all of ancient Egypt.” Nevertheless, they concluded the mummified people were “distinct from modern Egyptians, and closer towards Near Eastern and European samples”. “Our analyses reveal that ancient Egyptians shared more ancestry with Near Easterners than present-day Egyptians,” they wrote. And they added: “We find that ancient Egyptians are most closely related to Neolithic and Bronze Age samples in the Levant, as well as to Neolithic Anatolian and European populations. In other words, preserving a Leftist narrative that privileges sub-Saharan Africans over people of European and Middle Eastern ancestry with respect to the high culture of Egypt – and the “multiculturalist” (read: anti-Western) agenda that entails – is the most important consideration, even if the science clearly demonstrates that that’s a load of bull-puckey. Once again, it’s ironic how the Left trumpets “science” when they think they can use it to discredit traditionalist ideas, but abandon it in a hurry when it supports traditional understandings, rather than their revisionist agenda! At any rate, it seems fairly clear that the primary survivors of the “original” ancient Egyptians are the Copts, who survive as an often-persecuted minority of Christians in modern Egypt, having been converted by the missionary work of St. Mark the Apostle. It should not be forgotten that Egypt was host to a thriving Christian civilization – centered on Alexandria, one of the five ancient Patriarchates and a major center of Christian learning and devotion – prior to Egypt’s violent subjugation by Islam. And it was with that shift that the genetic composition of Egyptians, which as this article points out had remained “genetically relatively unaffected by foreign conquest and rule” prior to the Islamic invasion, shifted as well. On a lighter note: Time change – we think we’ve got it rough…! For many people, the time changed back from Daylight Saving to Standard Time overnight last night. And we think we’ve got it rough, trying to remember to set our clocks back…! Author The Anglophilic AnglicanPosted on November 5, 2017 Categories UncategorizedTags Archaeology, Britain, British History, Cycles and Seasons, HumourLeave a comment on On a lighter note: Time change – we think we’ve got it rough…! Ever since the days of Homer, Greeks have long idealized their Mycenaean “ancestors” in epic poems and classic tragedies that glorify the exploits of Odysseus, King Agamemnon, and other heroes who went in and out of favor with the Greek gods. Although these Mycenaeans were fictitious, scholars have debated whether today’s Greeks descend from the actual Mycenaeans, who created a famous civilization that dominated mainland Greece and the Aegean Sea from about 1600 B.C.E. to 1200 B.C.E., or whether the ancient Mycenaeans simply vanished from the region. The title of this piece is a touch misleading, in that it may seem to imply that the ancient Greeks really were descended from the gods, or at least their heroes were. But although the truth is somewhat more prosaic, it is no less interesting! In addition to the usefulness to historians, archaeologists, mythologists, and students of literature of confirming that there was and is a Mycenaean – and indeed, Minoan – connection with modern Greeks, and a very significant one, this also is further evidence that ancient myths and legends, originally carried down through the oral traditions of a people and only later put to writing, may nonetheless have striking validity. This is not news to many of us, of course; but it may be to others, who have bought into the popular misrepresentation of “myth” as a synonym for “fallacy.” Leaving aside the 19th centuries discoveries of such men as the highly controversial Heinrich Schliemann (Troy) and the brilliant but political Arthur Evans (Minoan Crete), it is remarkable how many biblical accounts have been either confirmed or at least rendered markedly more probable by archaeological discoveries. Nowadays, it seems that genetics is following in those hallowed footsteps! Skeletons found at a site, said in legend to have been visited by King Arthur, are the oldest example of monks found in the UK, archaeologists say. This may not be the chapel which legend tells was founded by Joseph of Arimathea, when he brought the Holy Thorn (and perhaps, also, the Holy Grail) to Glastonbury — or, then again, it may be — but it is fascinating nonetheless. This ancient chapel near Glastonbury, linked to the Arthurian traditions, houses skeletons indicating the oldest example of a monastic community thus far found in Britain. That alone makes it pretty awesome!